Dispels internal wind due to hyperactive liver yang, disperses exogenous wind and wind-damp, nourishes liver blood, reinforces kidneys. Used for syndrome of deficiency of the liver and kidney, marked by hypertension, vertigo, dizziness, tinnitus. 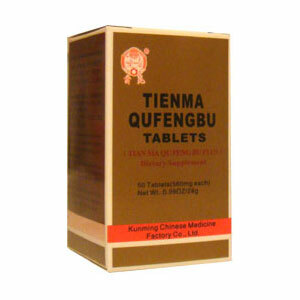 Tien Ma Qu Feng Bu Tablets helps promote overall circulation and maintain healthy skeletal function by establishing body’s natural balance. Dispels internal wind due to hyperactive liver yang, disperses exogenous wind and wind-damp, nourishes liver blood, reinforces kidneys. Used for syndrome of deficiency of the liver and kidney, marked by hypertension, vertigo, dizziness, tinnitus, which are also associated with exogenous wind invasion and damp stagnation, concomitant facial paralysis, stiff or paralyzed limbs, numbness of extremities, aversion to cold, lumbago, pain in joints and muscles. Do not use if you have a cold or a fever.